Wow, that was quick! In my my 2007 Wrap-Up and Outlook for 2008, I mentioned a few outstanding items that hadn't been answered. Specifically, I mentioned Biodel, Inc. and noted that the company hadn't stated how it planned to manufacture its rapid-acting insulin formulation -- whether they would form a marketing partnership with another manufacturer, use contract manufacturing from a third-party, or go it alone. Today, Biodel issued a press release which was primarily focused on the fact that the company had completed enrollment of its two pivotal Phase III clinical trials of VIAject (one for patients with type 1 diabetes, and another for patients with type 2 diabetes). That is certainly news that the company is adhering to its development timeline as disclosed in their most recent quarterly earnings release. But also included in that release was the answer to that question I raised. Specifically, I noted "Although the company has not stated whether it will seek a marketing partner ... upon conclusion of VIAject's Phase III clinical trials in the U.S. and Europe, the company will soon need to address this critical question". As of this afternoon, we now have an answer to that question. The answer is that Biodel will likely acquire synthetic human insulin in bulk from another party, then the company will then take that bulk insulin, add their patented ingredients (which enables VIAject to be absorbed as rapidly as insulin analogs do), bottle it or put it into pens and/or pen cartridges in their own "fill and finish" factory, add the required FDA inserts, and package it for distribution. "The Company also announced its intention to build and operate a fill and finish manufacturing facility for VIAject™ on the campus of its current headquarters in Danbury, Connecticut which will be dedicated to manufacturing a full line of VIAject liquid formulations and presentations. The dedicated manufacturing facility will improve margins, provide superior quality control, and better inventory control. Biodel anticipates that the facility will cost under $15 million and will be available for commercial production in 2009." Just who will Biodel buy bulk insulin from? There are actually a number of possibilities and that question will likely be put out for competitive bidding once VIAject has received FDA approval. Among the potential suppliers: the Sandoz generics unit of Novartis, Teva Pharmaceutical Industries which has manufacturing facilities around the world, generic-giant Barr Pharmaceuticals, Diosynth (a Dutch contract biopharmaceutical unit of Schering-Plough), and Bangalore, India-based Biocon Pharmaceuticals, Ltd. immediately come to mind (largely because the company sells its ability to do contract manufacturing of this type). Since Poland's Bioton, S.A. has already announced its plans to enter the U.S. insulin market by 2010, they may not be a likely potential parter. Another possibility I noted (kind of in passing) was a Calgary biotech company called SemBioSys Genetics Inc., which has developed a method of producing synthetic insulin in safflower plants, which may also be a possibility. SemBioSys is now currently working with the FDA for approval on its plant-based method of manufacturing insulin. They have announced plans to apply for FDA approval using the 505(b)(2) New Drug Application method. However, to date, Sandoz is one of the few companies to use this route for its Omnitrope Human Growth Hormone, and the company had to sue the FDA to get a decision from the agency (see here for background on that). 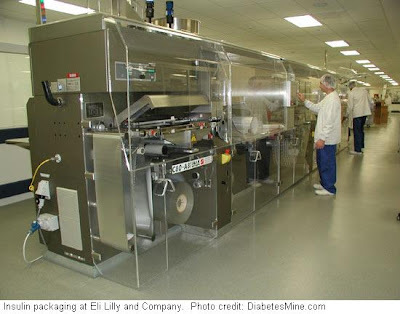 The current method of insulin manufacture is extremely capital-intensive, as recombinant insulin is cultured in stainless steel bioreactors, which must be approved by the FDA. The big advantage SemBioSys could bring is that the company claims factories used to make safflower insulin are significantly cheaper to build than the current method, therefore its production methods would be up to 40% less expensive. To be sure, bio-engineering of plants has something of a public relations problem in many parts of the world (many people Europe, for example, call genetically modified vegetables "frankenfoods"), so the company may need to weigh that issue relative to quality control concerns at factories outside of the U.S., Canada or Western Europe (such as in India). That favors Sandoz, Teva or Diosynth, but right now, its anyone's guess. But Biodel's latest news release does indeed suggest the company has a very high degree of confidence that Phase III clinical trials will not reveal any surprises (in part, because the company's patented additives basically use already FDA-approved ingredients added to recombinant human insulin). I will be eager to see the company's business presentations made to investors in the coming year. Has anyone actually thought about whether or not these additives to the insulin analogs will increase the risk of severe hypoglycemia? I mean, Symilin was supposed to help with this and yet I've had more severe lows while on Symilin than when I was trying to manage my diabetes with insulin (Humulog and Lantus) alone. Have they considered what this product could do to a Type 1 diabetic who has a high, injects this stuff to correct and then has to drive somewhere? Ideally, the diabetic would test before getting behind the wheel, but that's no guarantee that their blood sugar wouldn't quickly go too low for safe driving. I think you may be mistaken. These additives will not be added to insulin analogs, but to regular insulin (the type that was discovered by Banting and Best in 1921). The additives provide the regular human insulin with absorption, distribution, metabolism, and excretion (known as "ADME" profile in pharmaceutical industry lingo) as today's analogs. Note that the issue related to absorption is discussed in the December/January issue of Diabetes Health, but the reality is that the bigger the dose, the longer it takes to be absorbed (analog or not) because of the fact that insulin is dosed subcutaneously rather than directly into the bloodstream as the beta cells would secrete insulin. At present, the adverse effect reporting required by the U.S. Food and Drug Administration (FDA) means that VIAject does not differ substantially from today's analogs and may actually be somewhat safer (at least relative to hypoglycemia) for reasons Biodel disclosed at last year's ADA Scientific Sessions. Note that VIAject is current in Phase III Clinical Trials, so if there are differences we should expect to see them in the trial results to follow.